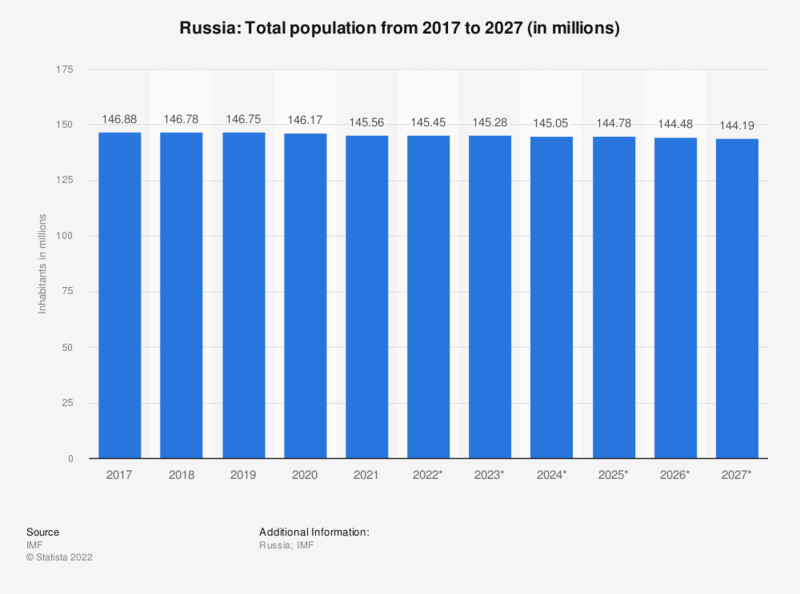 This statistic shows the total population of Russia from 2012 to 2017, with projections up until 2022. In 2017, the total population of Russia was around 143.99 million people. Only a fraction of them live in the major Russian cities. With almost 12.1 million inhabitants, Moscow is largest of them. Russia holds the sixth largest economy in the world and is one of wealthiest nations. Following the 1998 Russian financial crisis, Russia introduced several structural reforms that allowed for a fast economical recovery. Following these reforms, Russia experienced significant economic growth from the early 2000s and improved living standards in general for the country. A reason for the momentous economical boost was the rise in commodity prices as well as a boom in the total amount of consumer credit. Additionally, Russia is highly dependent on the mining and production of natural resources, primarily in the energy department, in order to promote economic growth in the country. Due to large energy reserves throughout the country, Russia has developed a stable economy capable of sustaining itself for many years into the future. The majority of Russian oil and energy reserves are located in the Western Siberian areas. These natural gas liquids, along with oil reserves that consist of crude oil, shale oil and oil sands are constantly used for the production of consumable oil, which is an annually growing industry in Russia. Oil products are one of Russia’s primary exports and the country is able to profit entirely off of sales due to high prices as well as high demand for such goods.